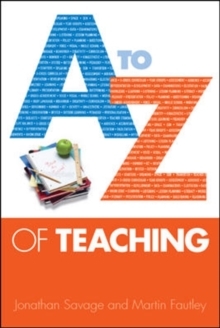 A - Z of Teaching provides an informative, engaging and accessible introduction to the art and craft of teaching, introducing you to a range of essential topics alongside some of the key ideas and key thinkers from the educational research literature. The topics covered range from practical teaching advice on areas such as questioning to exploration of significant themes within education such as creativity. Each entry includes:An introduction to the topic with a definition of the termAn exploration of key ideas within the topicReference to the work of key thinkers who have explored the topic in the educational literature How these ideas apply in your day-to-day practice of teaching and learningA set of questions for you to consider as you seek to develop your pedagogy in a particular topic areaFurther reading and references, including links to relevant writings in other publications or online sourcesTeaching is a broad and complex activity so whether you are thinking about becoming a teacher, training to be a teacher, or a qualified teacher wishing to keep abreast of the latest thinking in the field, the ideas contained in this book will prove helpful and constructive as you seek to develop your teaching skills. "Every so often, a new idea unfolds that seems so deceptively simple that one wonders why it hasn't appeared before now: this is the case with A - Z of Teaching. Serving as a high-definition map of classroom teaching, it provides mentorship for survival and thriving in the profession. Comprehensive without being laboured, rich in concepts without succumbing to clutter, ingeniously economic in the identification of key themes without being trifling, Savage and Fautley manage to distil the important and inspiring from vast amounts of theory, research and practical experience of teaching, and present the essential elements in a most accessible manner for early career teachers. More experienced educators will also find many gems to renew and inspire their practice. The approach is pragmatic whilst never seeking to trivialise the challenges of teaching or the vast amounts of extant theories. Most importantly, the reflective questions at the end of each section serve to provoke further thinking, research and action, thus contributing meaningfully to the development of effective and reflective teachers for contemporary schools. "Regina Murphy, PhD, Senior Lecturer, St Patrick's College, Dublin City University, Ireland"The construction of this book is very satisfying; it is so straightforward to access and simultaneously works at so many levels. Using the tried and tested structure of an A to Z listing, Jonathan Savage and Martin Fautley consider a number of highly significant aspects of education, pedagogy, and professional issues for teachers at all stages of their professional development. In their consideration of some 103 topics, they skilfully blend key theoretical underpinning with current practice in the classroom, making this book extremely useable by teachers in all sectors and age-phases. The range of topics makes this especially useful because it covers some big issues but also explores some less frequently covered things such as audience and elicitation. What I have found particularly helpful is the fact that, in this book, I readily recognise aspects of my own classroom practice in the overview of each topic, but I am encouraged and inspired to reflect more deeply on my professional development in the light of the collected wisdom and challenging questions. This book will be an invaluable tool for training and beginning teachers as well as for those with years of experience. The inclusion of key questions and further reading means that it can serve as a very accessible reference book, an aide memoir or as a stimulus for more detailed debate, discussion or professional development. Consequently it will support the work of individuals, department or phase teams or even larger groups. The potential to individualise training and coaching by referring trainees to relevant entries is great. I will certainly want to use it when working with trainee teachers and also with teachers undertaking CPD and Masters qualifications. I look forward to Volume 2 appearing in the future. "Simon Spencer, Birmingham City University, UK"I am delighted to welcome this brief but important compendium of the A - Z of Teaching written by Jonathan Savage and Martin Fautley, authors with extensive experience of teaching. This book provides eloquent insights and distilled definitions of key terms and concepts in an introductory way that will inform, inspire, engage and help navigate through the maze of key terms which busy students in initial teacher education and practising teachers simply must read. "Pamela Burnard, Faculty of Education, University of Cambridge, UK"This is a very entertaining and well-structured resource, written in easy and accessible language. It contains a serious, carefully referenced introduction to a number of major issues encountered in the early stages of learning to teach.